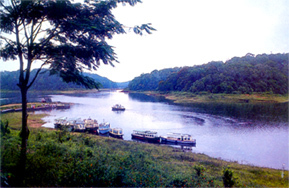 The best time to visit Periyar is between October and May. 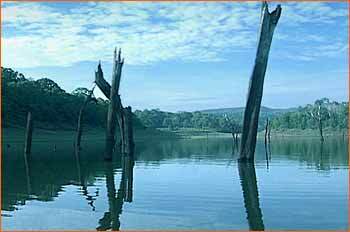 The best chance of watching animals during the hot months of March, April and May, when water gets low and the grass dried out, animals especially elephants come down to the Periyar lake to bath and frolic in the water along with their young ones. The varied habit at in the sanctuary supports a number of species of terrestrials, aquatic and arboreal animals. Elephant behaviour can be watched in such absolute comfort and safety. The wildlife population consists of estimated 600 elephants, 450 sambar deer, 550 wildboar, 180 troops of Nilgiri languor monkeys, 26 troops of bonnet and lion-tailed Macaques, 400 porcupine, 100 gaur, 50 mouse deer and a number of Bears, Wild dogs, jackals, Civets, flying squirrels, Mongoose, Pangolin cobra and others. Nilgiri Tahr is also reported to be seen in this area. There are now an estimated number of 45 Tigers and 15 Leopards in Periyar sanctuary. The lucky tourist may even see a tiger.